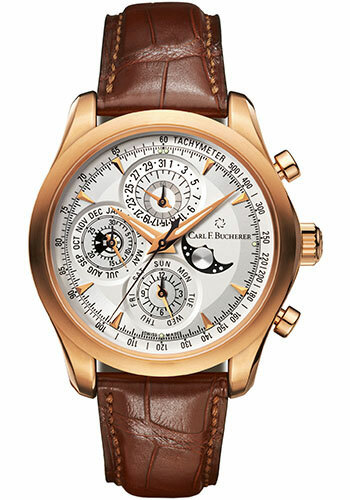 42 mm 18K rose gold case, 14.3 mm thick, sapphire crystal back, sapphire crystal with anti-reflective coating on both sides, silver dial, Caliber CFB 1904 automatic movement with hour, minute, small seconds, flyback, leap year, chronograph: hours, minutes and seconds counters, perpetual calender with month, date, day of the week, moon phase and tachymeter, approximately 50 h of power reserve, brown alligator strap, pin buckle with 18K rose gold . Water resistant to 30 m.
42.5.mm 18K rose gold case, 14.3 mm thick, sapphire crystal back, sapphire crystal with anti-reflective coating on both sides, black dial, Caliber CFB 1904 automatic movement with hour, minute, small seconds, flyback, leap year, chronograph: hours, minutes and seconds counters, perpetual calender with month, date, day of the week, moon phase and tachymeter, approximately 50 h of power reserve, black alligator strap, pin buckle with 18K rose gold . Water resistant to 30 m.